Today.Az - Does drinking tea cool you down in hot weather? Does drinking tea cool you down in hot weather? Tea is a popular hot beverage all across the world. People throughout the world enjoy tea in all of its kinds. These are all made of different herbs and plants. Each one has a unique taste and benefits to your health. In fact, tea is the second most popular drink after water. Many researchers believe that tea comes from China, where it originated as a medicinal drink in the 3rd Century AD. Drinking tea has become an indispensable part of Azerbaijani culture. 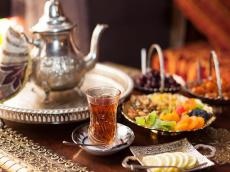 In Azerbaijan, tea is associated with warmth and friendliness, therefore, the tradition says that one should not allow the guest to leave the house without having at least one cup of tea. A tea ceremony in Azerbaijan means freshly brewed, strong, bright-color, hot tea served in cups or crystal glasses, in particular, "armudu glass" i.e. "pear-shaped glass". Hot tea is served continuously when there are guests in the house or when there is an interesting conversation. Generally, tea is poured into ceramic and china dishes. Water is boiled in various ways, in particular, in heated metal containers known as samovars. Drinking tea has many health benefits. It reduces the risk of heart disease. Tea also contains antioxidants called "flavonoids", which may slow down the onset and risk of heart disease. Adding black tea to your daily routine is an easy way to boost heart health, reduce blood pressure, lower blood sugar level, reduce the risk of cancer and hydrate body. Many different types of tea, such as white, green, oolong and black, are beneficial. For example, green tea boosts the performance of the liver, and prevents arthritis by strengthening bones. If you want to get the most benefit from green tea, try and brew it from loose leaves rather than the tea bag. Black tea is great for preventing viruses in the mouth and gums and has also been known to widen impaired arteries by as much as 50 percent, preventing blood clots. Summer heat waves and hot weather can affect anyone. Drinking a hot beverage on a hot day actually can cool you down. The idea of drinking hot drinks in hot weather goes back centuries. A cup of tea could help people keep cool during a heat wave. Hot drink adds heat to your body, but that heat actually increases the rate at which you sweat, which can help cool you off. The human body can produce up to two litres of sweat per hour. It is an effective way of reducing your core body temperature. As long as the sweat can escape from your skin, hot tea can cool you down. However, if you’re drinking a hot drink in a very humid environment where the sweat won’t evaporate then hot tea probably won’t do the trick. In addition, tea blends with cooling spices can also do your body good to keep you comfortable. Lemongrass teas, spearmint, peppermint, hibiscus blends can help cool you down in the summer.